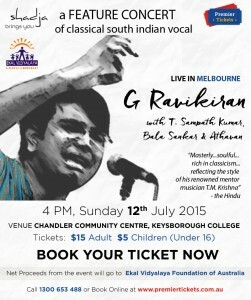 Premier Tickets is proud to be the online ticketing partner for G Ravikiran’s Carnatic Feature Concert to be held on 12th July at Chandler Community Centre, Keysborough. G Ravi Kiran is a popular name in the world of Carnatic music. He began learning music at the tender age of 8 from Vid. Gayathri Keshavan and was later trained by Sri RK Srikantan and Sri TM Krishna.His Carnatic music journey took a halt when he joined BITS Pilani for his Btech degree. Become a part of the musical evening with G Ravikiran on 12th July in Melbourne. Shadja – Just one note. The beginning. The cornerstone of Indian Classical music systems. Simple, yet subtle, soft yet powerful, steady yet dynamic, Shadja is the eternal, the constant, the ONE note around which all others adorn as gems to draw out its incomparable magnificence. Universal and unwavering, yet everyone has their own, so unique. As an organisation, as a movement, Shadja aims to help people of all walks of life find their own Shadja, that musical crescendo that captures a lifetime’s emotion in a single perfect moment of music. A rediscovery of Classical Indian music in a modern context through performance, collaboration, discussion, debate and the sharing of a passion for the old and new. Find yours with Shajda! !